Americans can order live chickens, ladybugs, knives, and flamethrowers delivered right to our doors—some in just a few hours with Amazon! But a person can’t legally order a bottle of wine from California and have it shipped to Kentucky. You also can’t call a brewery in Oregon and have them ship a six-pack to Rhode Island. In fact, having any out-of-state alcohol delivered to Utah is a felony crime. Why? America’s alcohol-shipping laws are often described—politely—as confusing. But they’re not so much confusing, experts say, as they are varied and complex. Many of America’s alcohol laws were written after the 21st amendment repealed Prohibition in the 1930s—and that includes our shipping laws. That amendment left shipping regulation up to individual states, who all came up with laws at a time long before FedEx and UPS. But the Supreme Court’s decision to take up a wine-shipping case (Tennessee Wine & Spirits Retailers Association v. Byrd) next session means interstate alcohol shipment is as current a topic as ever. “You’re dealing with 50 different countries, basically,” is how Dave Dobrow, vice president of business development and marketing for Copper Peak Logistics, a direct-to-consumer wine-shipping company, explains to me. That means that right now, each state is able to determine what permits are necessary for a supplier (winery, brewery, distillery) to sell or ship goods within their borders. Some states require a business to have a physical presence in that state before they can begin shipping alcohol there; others are less or more restrictive. Utah, Kentucky, and Mississippi are three of the most restrictive states when it comes to alcohol shipping. As mentioned above, it is a felony to ship alcohol directly to consumers in Utah. In Kentucky, shipping carriers won’t deliver alcohol to consumers because it’s too much effort to sort out which counties are “dry” and which are “wet.” In Mississippi, direct shipping is flat-out prohibited by law. States with some of the least restrictive alcohol-shipping laws include Alaska, Florida, Minnesota, and the District Of Columbia, where no special permits are required to ship to consumers. If you want to get specific, check out this handy state-by-state guide from The Wine Institute, a California wine trade group, and Compli, an alcohol compliance services company. Penalties for breaking such laws range from fines to, in the most severe cases, a revocation of a business’ federal alcohol license. Those laws, though, have been interpreted as applying not just to businesses that want to sell wine, but to individuals, too—which is why I can’t legally ship my brother in New York a bottle of beer brewed here in Montana. The United States Postal Service won’t ship alcohol, period; FedEx and UPS require special agreements for such exchanges, and can “dispose of” any sneaky booze shipments. 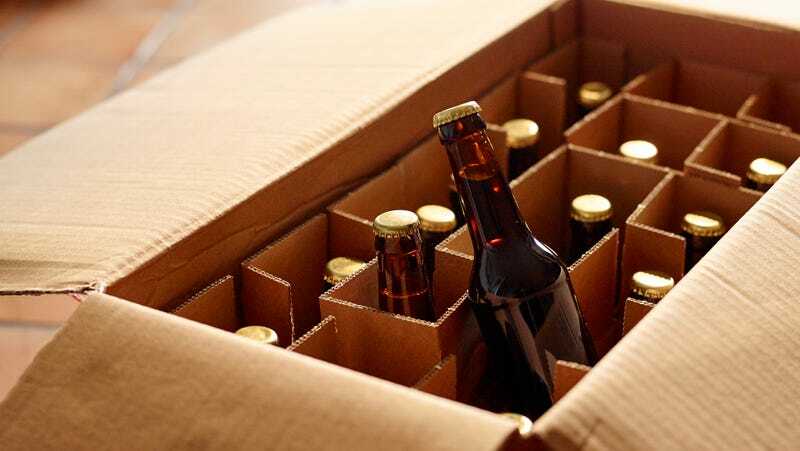 These carriers would have to suspect there’s alcohol in your box in order to dispose of it, so some individuals are able to get away with occasionally sending a beer to a friend in another state. But making a habit, or a business of it, and you could find yourself in hot water. The question on people’s minds in 2018 is whether the upcoming Supreme Court case could majorly alter the fundamentals of alcohol-shipping laws. The answer is yes, and no. Back to Tennessee Wine & Spirits Retailers Association v. Byrd—this case challenges Tennessee’s requirement that a retailer or wholesaler prove residency for a certain period of time before legally selling booze there (Wine Spectator has a longer explanation of this case). So if ruled narrowly, the Court could just take up the issue of residency requirements. But some in the industry are crossing their fingers the Supreme Court will rule on whether banning out-of-state retailers is itself unconstitutional. What this means, though, isn’t that the whole three-tier system crumbles. Even if the court ruled broadly, Carroll says, “that doesn’t change anything overnight.” If state laws were deemed unconstitutional, those legislators would be tasked with creating new alcohol-shipping and -selling laws. “Some states would certainly level up [become more restrictive], some states would certainly level down [become less restrictive] and it would certainly be an interesting process,” Carroll says. Perhaps even more interesting is what a Supreme Court ruling could mean for imported wine. Companies can, as of October, ship wine direct-to-consumer in 46 states, Carroll tells me, but that only applies to wine made in the U.S.
“So from a consumer standpoint, they can get American wines. They’ll have a really hard time getting a wine from France or Australia [imported to a different state],” Carroll explains. The upcoming case has the potential to change that—which is why lovers of French Champagne and Spanish verdejo should keep an eye on it. But if you’re expecting to wake up after the Supreme Court decision and start shipping booze all willy-nilly, you’ll be in for a reality check. States will still be able to craft their own laws, and those laws won’t just allow anyone and everyone to ship booze.